Although the following two forms describe the same addition process, sometimes it is easier to solve a problem using one form than the other. The ‘carry’ is more significant than the number that we are writing under the line; to avoid forgetting to write the ‘carry’, get in the habit of saying, say, 7 + 5 = 12; then write the 12, in that order: first the 1, as a carry, and then the 2, under the line. Another way to add the numbers is adding by place values; this is longer but avoids errors of forgotten carries. Real numbers (a.k.a. 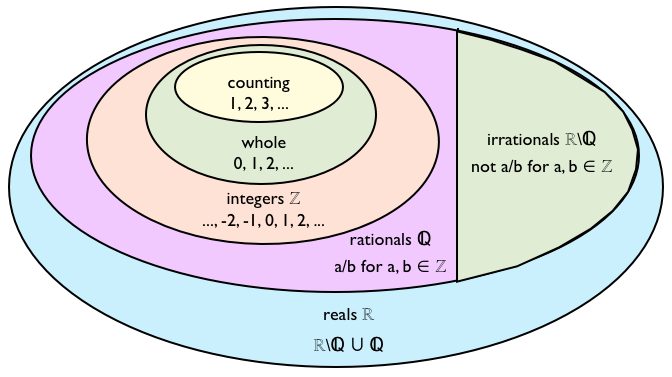 ℝ): This set contains all the rationals and irrationals, i.e., all the numbers in the number line. 5. Find the following sum using both term-by-term addition and Gaussian addition. 1 + 2 + \dots + 10 = ? 11 + 13 + \dots + 49 = ?